Just one! Standard and original. Facebook is crazy. A girl I grew up with through grade school and high school just posted some of her high school pics. She was a cheerleader at our Moore, Ok HS. She just posted a pic of the cheerleaders riding in a red convertible during the 1977 Homecoming Parade! I always wondered if anyone had any pics of my car in that parade!!!!! I remember the clutch getting hot as I kept trying to not engage too hard and drop the girls off the back of my trunk lid! Then right after the parade was over it started raining hard! No one got wet - I was liking that power convertible top!!! Over the last few days (now WEEKS lol) I have been trying to save the original air cleaner assy for my convertible. It seems that many years ago - about 1977, the owner (ME) thought it would be cool to put ram air setup on the car. So I went to one of the local Ford dealer's parts counter and ordered all the ram air pieces. I bagged up the original base without the chrome lid and just stored it away. Now fast-forward to today's times and I am wanting to return the car to as stock and original as I can. 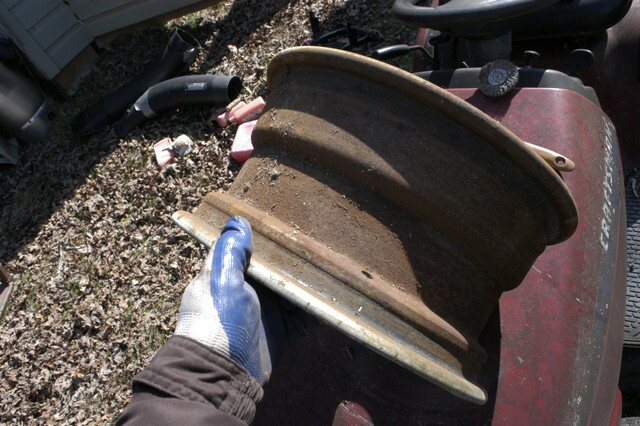 So I get the original air cleaner base and remove the bag and surface rust had taken its toll. 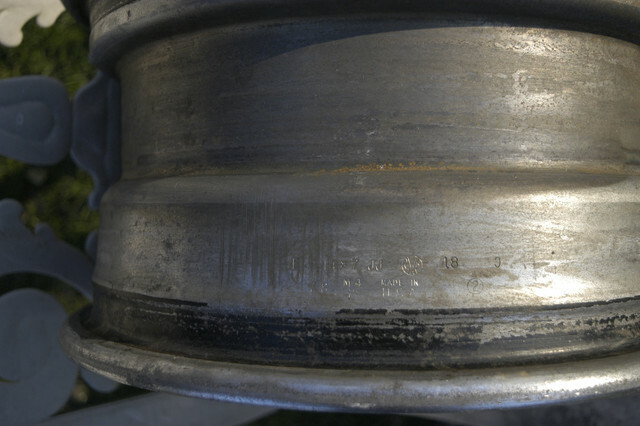 Much of the original finish was rusty or terribly faded. So I worked with friends who have bead blasters at their disposal and they helped me attempt to strip/prime and paint. One problem after another. Just could not get a consistent coating of the correct color and even had some texture issues. So after a few unsuccessful tries at these rattle-can restos, I decided to have it stripped once more and have all powder coated. I will do the valve covers next so that all will match. And I will be able to replicate the factory stamping on the valve covers after they are coated. I almost forgot - the original chrome air cleaner lid was kept in my house up in a closet shelf with some of my Ford related books. So luckily, it was still nice. While my car was at Chuck's house a while back - that lid was with a bunch of parts for the car. Chuck found it and put his special detailing touch to that lid so it looks even better now!!! I can't wait to see the finished air cleaner assy. It will be the lighter blue but that was the color of all my factory stuff under the hood anyway. 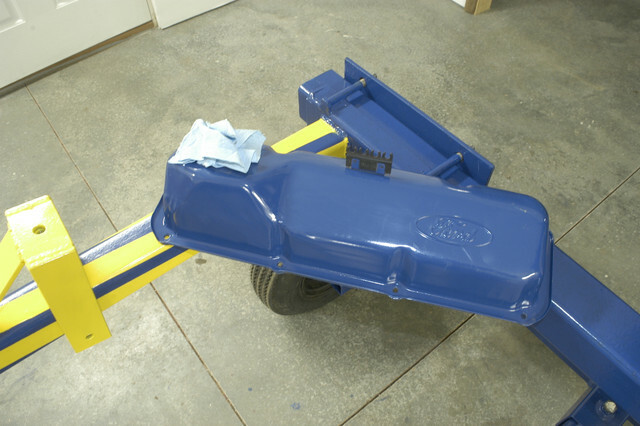 Color is very close to Duplicolor DE 1621 OLD FORD BLUE. Here is the painted dipstick top - that came out looking great BTW, alongside the panel of the color I chose for the powder coat. And they are doing this dipstick just in case to make sure all matches. Great that you are getting that car going again. Just some info on getting the right color for the paint. I do think it is called Ford Corporate Blue. I actually got our local Lowe's to scan an original air cleaner and mix me paint for doing some of my shop equipment in the Ford Corporate Blue. Also our local Tractor Supply sells the paint already mixed I believe in quarts or gallons. The paint I got at Lowe's is similar to Rustolium to help the steel not rust. It is their brand. Worked great can spray, brush or roll. I rolled most of the equipment. Painted the rotisserie, brake lathe, hydraulic press and some other items. To keep the left over paint from hardening in the can I put in glass jars with rubber seals works great. When I do valve covers and air cleaners I strip them with liquid aircraft stripper and then put in my molasses tank to get the rust off. I also blast some areas and then phosphate then prime with etching primer. They did not prime any of those parts so rust is under the paint. Keep the info and pictures coming. As I continue to get this old thing back on the road, I find it necessary to appreciate any positive improvements. 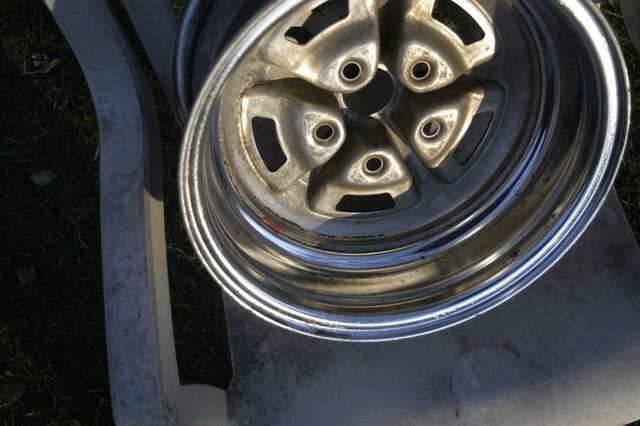 I knew my original wheels had been through all my rough high school days of neglect. I would do a quick clean and polish for a show at the annual Tulsa Shelby meet and occasionally before a local show but that was about it. Anything else was just a wash and dry. 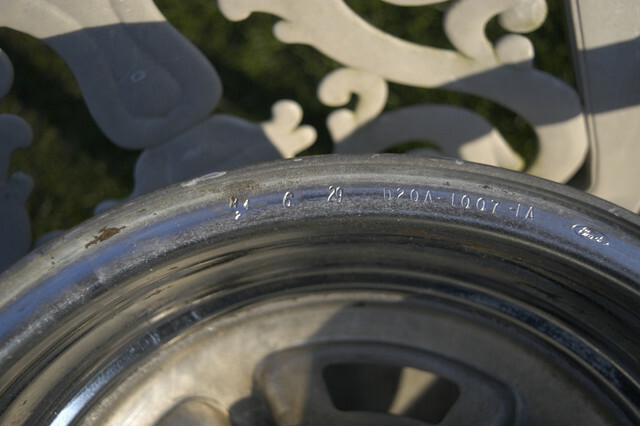 So as I began to clean and detail my Magnums, the thick crud on the back of wheels did not surprise me. I decided to clean them in steps. 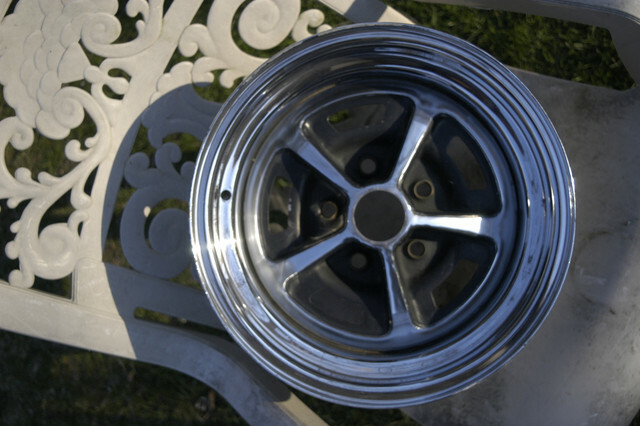 Beginning with Maguires Chrome Wheel Cleaner, I had excellent results removing all those years of brake dust and etc. Then I used 0000# steel wool and some WD-40. This helped to remove some of the more stubborn stuff. Some just would not come clean so I left it. Then I re-cleaned with some Dawn soap and water. Dried and then used dry 0000# steel wool again. The last step was to simply use chrome polish and buff. I am very pleased with the results! I popped on one of my NOS caps to make that final pic look more finished. And for those that remember - these were VERY easy for someone to 'borrow'. I will do the inner "C" clamp trick to keep the springs extended and make it much more difficult to remove! Wow they cleaned up real nice. Looks great. But I am lazy I did mine in the molasses tank. You have to take the tires off so they will not float but no or hardly any effort. 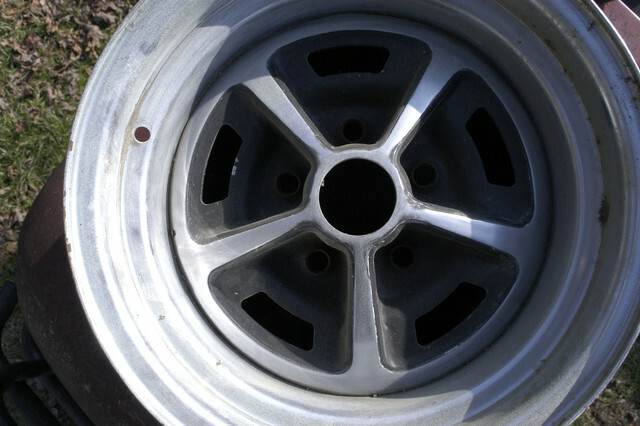 This wheel had sat in barn for over 25 years and was very crusty but came out looking pretty good. I also sprayed clear on the back side to prevent rust again. The molasses will not remove paint unless there is rust under it and does not hurt the chrome. It will eat aluminum up for sure. So if anyone has some rusty wheels you want to clean get some molasses and mix 9 parts water to one part molasses. 5 gallons of liquid feed grade molasses makes you 50 gallons of solution. I have a 275 gallon tank so I can do bigger items. Can put fenders, trunks, dashes and such in and come out like new. I was at tire store the other day and had them pop tire off of another to drop in the tank. I have a quarter panel for 1950 Ford in there now should come out tomorrow and head to ebay. Sorry guys but I haven't been posting all the steps in this project BUT - I have finally got my 72 convertible to the point that it is road-worthy again! I have a video posted on my Facebook page (Ray Cantwell). I have not been successful posting videos on here! Huge thanks to my great friends who have sacrificed their time and efforts to help me get to this milestone! Lots more work to do, but for now I'm just happy I can drive it again! 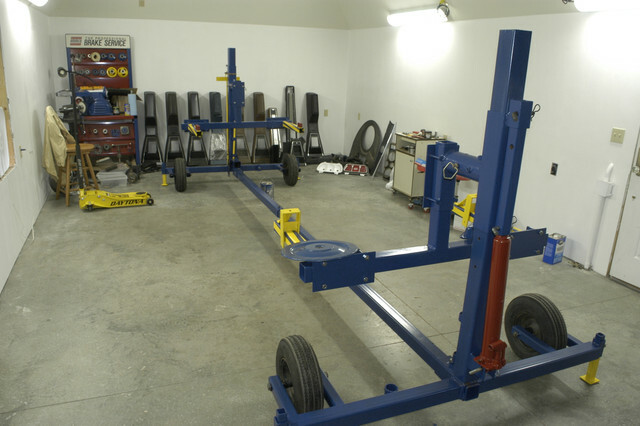 Big thanks to two of our members - Chuck (C9zx) and Richard (liftmech) for their massive assistance and knowledge!!!!!! Could not have gotten this far without them!